This article is about Fishtown (disambiguation)|Fishtown. For other uses, see Fishtown, Philadelphia (disambiguation). Fishtown is a neighborhood in Philadelphia, Pennsylvania, United States. Located immediately northeast of Center City, its borders are somewhat disputed today due to many factors, but are roughly defined by the triangle created by the Delaware River, Frankford Avenue, and York Street. Some newer residents expand the area to Lehigh Avenue, while some older residents shrink the area to Norris Street. It is served by the Market–Frankford Line rapid transit subway/elevated line of the SEPTA system. Fishtown is known as a working class Irish Catholic neighborhood. Recently, however, the neighborhood has seen a large influx of young urban professionals and gentrification. The name "Fishtown" is derived from the area's former role as the center of the shad fishing industry on the Delaware River. The name comes from the fact that a number of 18th and early 19th centuries German and German American families bought up the fishing rights on both sides of the Delaware River from Trenton Falls down to Cape May, New Jersey. Also, in the early 18th century, an English colonist was fabled to have caught the largest shad in the world in the Delaware River. The apocryphal local legend traces the name of Fishtown to Charles Dickens, who purportedly visited the neighborhood in March 1842, but records show this to be false, as it was named Fishtown prior to his visit. Within a few generations there was another influx of German immigrants, then still later in the late 19th century Polish and Irish Catholic immigrants. The community has three Roman Catholic Churches, St. Laurentius, built by the Polish immigrants, and the Holy Name of Jesus and the Immaculate Conception, both built predominantly by Irish immigrants. Holy Name along with Saint Laurentius and the Immaculate Conception continue to serve the community--albeit the latter two as worship sites and no longer as independent parishes. 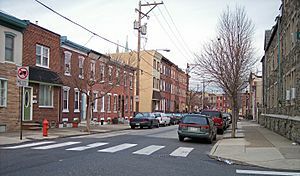 "1500 block of E. Berks Street, a typical residential street in Fishtown, in 2007. The neighborhood has been working class for centuries; poverty grew after jobs left during the deindustrialization era, which afflicted many "rust belt" cities, Fishtown's workers continued to maintain a stable working-class community. Most long-time residents trace their ancestry to Irish, German, and Polish Catholic immigrants. In recent years Fishtown has experienced moderate gentrification characterized by significant rises in housing prices and the opening of upscale art, entertainment, and dining establishments. An influx of artists and professionals has joined the ranks of police officers, fire fighters, nurses, carpenters, electricians, stonemasons, plumbers, sheet-metal workers, and teamsters. The neighborhood was chosen by the state of Pennsylvania to be the site of the SugarHouse Casino gaming complex on Delaware Avenue near Frankford Avenue. This choice deeply divided the neighborhood, causing conflict between those who believe it will bring jobs and economic development and those who believe it will lead to increased crime, addiction, and other social problems which negatively impact quality of life. A Community Benefits Agreement was reached between SugarHouse Casino and the membership of Fishtown Action and the New Kensington CDC, which will provide money for community projects that would not otherwise be available to the residents. The George Chandler School, Green Tree Tavern, and Penn Treaty Junior High School are listed on the National Register of Historic Places. Fishtown is the eastern most triangle of the larger surrounding Kensington District, created out of Northern Liberties Township in 1820. The Kensington District, when created, had a northern border of Norris Street, an eastern border of the Delaware River, a southern border of the Cohocksink Creek, and a western border of 6th Street. The Kensington District is not to be confused with the Kensington neighborhood of today. There has never been an official designation of this area as "Fishtown." Locals who lived in the eastern part of the Kensington district, namely those in Philadelphia's 18th Political Ward, referred to it as Lower Kensington, as seen in early buildings and churches, until the late 1800s. Fishtown stuck as the nickname because of the shipping and fishing industries along the Delaware River. By the 2nd and 3rd quarter of the 20th century, the area was no longer being called Kensington or Lower Kensington. The northern border of the Kensington District, founded in 1820, was Norris Street. In 1854, with the consolidation of Philadelphia County and City, the northern border of Philadelphia's 18th Ward was drawn as Norris Street. In 1852, the Kensington District expanded from Norris Street, north on West Street (now Belgrade Street) to York Street, then east to River. In 1905, with the large influx of Roman Catholic immigrants to the area, a new Roman Catholic parish, Holy Name of Jesus, was created. Its northern border was designated, and remains, York Street. York Street is used as the northern border by the Fishtown Neighbors Association. With a recent development boom in the area created in the triangle south of York Street, developers and realtors have made it fashionable to "extend" the name of Fishtown to any surrounding area, even though there is no historical basis. In the book Coming Apart: The State of White America, 1960–2010 (2012), Charles Murray names an imagined entity of white working class decay for Fishtown, inspired by Fishtown, Philadelphia. The comic book Fishtown (2007-8), by Kevin Colden, portrays a murder that occurred in Fishtown. In How to Get Away With Murder: Season 2, episode 12 ("It's a Trap"), set in Philadelphia, Sam says, upon learning Nate is going to Ohio: "Fishtown's going to the majors!" Fishtown, Philadelphia Facts for Kids. Kiddle Encyclopedia.